About this project: This clay house is made from slabs. It can be decorated in many charming ways. Both houses were painted with underglaze; one in earthy colors and the second in soft tones. To use proper clay building techniques, you may want to refer to the book: The Great Clay Adventure by Ellen Kong. Roll out the clay to have a thickness of centimeter. I used white clay, but choose the color and texture you want to work with. Cut out the roof (18x18 cm). Make a big “X” on this square, thereby making four triangles. Begin attaching the four walls of the house to its floor. Use slip and small coils on the inside when attaching the sides. Before assembling the roof, cut out one narrow slit where money will enter the house. Add a bird or birds on the roof. Color your art piece with underglazes. 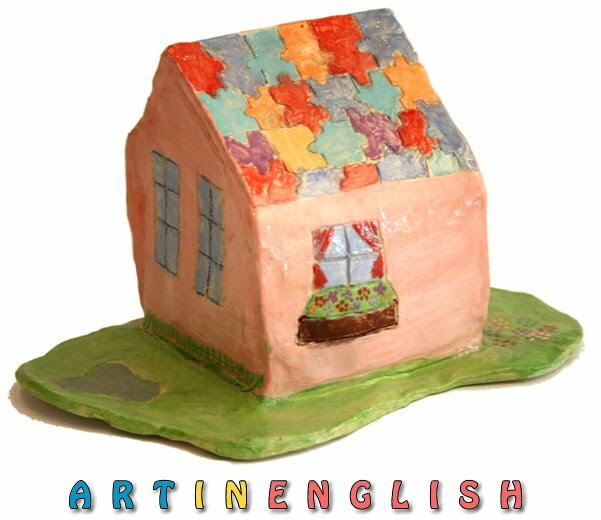 This project has been very useful in the art therapy setting. The house might represent the child’s home or the child’s school. After it’s fired, I place it on a large rectangle of cardboard (30 x 50cm) and begin creating the environment around the house: garden, trees, a path, street, add play cars and little people made of foam. Slowly we act through different scenarios that I know are part of the child’s life. If the house is built with a door that is in the open position, we decorate the inside with a carpet, table and chairs, and pictures on the wall. There seems to be a satisfying feeling that goes along with building one’s environment. A good book to read on this subject is Your Child and His Art, by Victor Lowenfeld. Good luck including this art project in your art therapy practice.